Artistic Pursuits 10142 West 69th Ave, Arvada, CO 80004 • 303-467-0504 www.artisticpursuits.com Review by Linda K. Foster Children, by their very nature, are creative beings and, unfortunately, too many art programs offer structured instruction that stifles this natural creativity. Artistic Pursuits takes the approach that teaching children to go beyond their first ideas and find solutions that are personal to them can stimulate creativity and the motivation to continue learning. Artistic Pursuits encourages students to explore their environment by looking at new things and new places and looking at them again and again until they see each in a new light. The creative process involves the artist starting with an image and manipulating it until it becomes technically and visually appealing, communicating what the artist is trying to say. Artistic Pursuits believes that this process can and should be developed at an early age and has designed programs beginning with grades K-3 and advancing to grades 4-12. Artistic Pursuits is the brainchild of Brenda and Dan Ellis, both working artists and homeschool parents. Their love for art began in childhood where they both admit to spending endless hours with pencil or paint brush in hand. Brenda is the author of Artistic Pursuits and is an honors graduate of the Kansas City Art Institute, with a bachelor’s degree in fine arts and a major in painting. After completing additional education at the Skowhegan School of Painting and Sculpture in Maine, she taught art for 17 years in grades ranging from pre-school to 12 in numerous homeschool and public environments. Dan is a graduate of the Kansas City Art Institute with a bachelor’s degree in fine arts and a split major in painting-printmaking. His impressive background includes teaching art and art history at Rock Solid High School and for various groups of homeschoolers and showing his artwork in Denver-area galleries. Artistic Pursuits is a comprehensive art program designed to involve the student in the creative process while developing observational skills. Each of the books, whether in the K-3 or the 4-12 levels, offer complete overviews and easy to understand introductions to the subject of art. Artistic Pursuits uses an impressive variety of interesting age-appropriate student projects to provide an excellent combination of art appreciation and art instruction. Grades K-3 books offer clearly written and easy-to-follow instruction. They are designed to incorporate parental participation with student creativity. For the first 5-10 minutes of each lesson, parents read information to their children. Children then spend approximately 30 minutes to an hour making their own art projects. Unlike many other programs that offer fairly rigid lessons designed to be completed within specific timeframes, Artistic Pursuit lessons are flexible and can be performed on a self-paced basis ideal for students of varying skill levels and capabilities. The three K-3 books are designed to be used once per week and each books covers approximately one year of art instruction. Book 1 of the K-3 series “An Introduction to the Visual Arts” offers 32 lessons with projects designed to capture student interest and imaginations while introducing principles of art. Lessons are presented in three sections: What Artists Do offers 10 lessons covering activities artists engage in while making art such as imagining and observing. Students explore drawing and painting techniques and gain experience in pencil, color and brush work. The second section, What Artists See offers 7 lessons covering elements used by artists in 2 and 3-dimensional works such as shape, form, and color. In these lessons, students learn to handle scissors, glue and paper forms. Finally, section 3, Exploring Ancient Art is comprised of 15 lessons covering ancient art from the cave paintings of France to book illumination of the 13th century. As students complete these lessons, their ideas about art are expanded. They learn that art is more than just a painting on a wall and is used by various cultures in different ways and for different purposes. Student activities in section 3 include mural, pottery, low-relief, paper art, bookbinding, mosaic techniques and more. Students using the K-3 series are encouraged to use the information within the book and their observations of the world as a starting place for their own ideas. In this way, they understand and use the concept of personal expression. Books 2 and 3 continue the study of art history, focusing on the lives of Renaissance artists to the art of today. 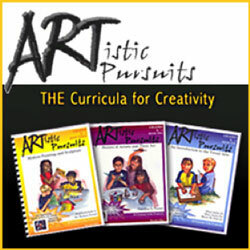 In addition to the excellent K-3 series, Artistic Pursuits offers instruction for grades 4-12. Three levels, Grades 4-6, Junior High, and High School, cover basic drawing and color principles in an engaging, fun, and age appropriate way. Choices in every lesson keep students interested and enthused about making art. Each book in this series has 16 units and four assignments within each unit for a total of 64 projects. Each level is designed as a 2 year curriculum of study although, as with the K-3 series, it is a flexible program that can be adaptable to individual student skill levels and interests. One element of the Artistic Pursuits series’ that was of particular interest while conducting this review was the inclusion of a set of fine art reproductions in each book. In other instruction books, only photos of art works are provided making if difficult at times to truly appreciate the details and qualities of the piece. Artistic Pursuits is a well-designed art program that includes a comprehensive and engaging overall review of art history. It offers students many varied techniques, processes, and materials to work with as they explore their own unique abilities and interests using the creative process. For additional information, please visit www.artisticpursuits.com. L.K.F.